2016 Honda HR-V goes on sale May 15. Based on the Fit hatchback, the HR-V is Honda's first foray into the ultrahot subcompact crossover segment. The HR-V, sold as the Vezel overseas, is built in the same Celaya, Mexico, plant as the current Fit. Like its hatchback sibling, the HR-V moves the fuel tank to below the front seats, which allows for numerous seating configurations and the most interior room in its class. That package comes with some of the segment's best fuel economy, crisp styling and a sub-$20,000 starting price. Weaknesses: Suspension and ride may be too stiff for some buyers. Bottom line: The HR-V, delayed for months, is worth the wait. Nearly a week of evaluation after a media launch in Venice, Calif., proved the HR-V could swallow cargo, park anywhere and offer a great view of the road. The loaded EX-L Navi model tested also offered a level of comfort and refinement that's rare in the subcompact world. Wheelbase 102.8 in. 101.2 in. Length 169.1 in. 166.6 in. Width 69.8 in. 74.2 in. Height 63.2 in. 66.5 in. Curb weight 2,902 lbs. 3,044 lbs. Base engine 1.8-liter, 4-cyl. Turbo 1.4-liter, 4-cyl. EPA mpg 28 city/35 hwy. 24 city/31 hwy. LOS ANGELES -- Honda's all-new HR-V is showing up to the party later than expected, but that hasn't dimmed the automaker's high hopes for the subcompact crossover. The 2016 HR-V goes on sale on May 15, and Honda predicts it can sell 70,000 a year in the U.S. once production is running at full tilt. Without a clear front-runner in the nascent segment, Honda figures it can establish dominance by offering a something-for-everyone model that doesn't exist yet. "It's a bit of a challenge because it's such a new segment and we're not entirely sure what the customer wants," Jeff Conrad, Honda Division general manager, said at a press drive of the HR-V here. "So we're hoping to give the customer everything." Even in this emerging segment, Honda will be playing catch-up. The automaker first showed images of the HR-V ahead of the 2014 New York auto show. The vehicle was expected to hit production in the fourth quarter of last year, and go on sale in January, according to Dave Sullivan, an analyst at AutoPacific. But production delays at Honda's new plant in Celaya, Mexico, for the HR-V and the Fit hatchback that it's based on, pushed those dates back. "You've got a brand-new work force in a brand-new location," Conrad said. "So yeah, there was a bit of a learning curve for us." Meanwhile, other competitors slipped into the market, including two siblings from Fiat Chrysler -- the Jeep Renegade and Fiat 500X -- that were spotlighted in Super Bowl commercials in February, as well as the Chevy Trax. 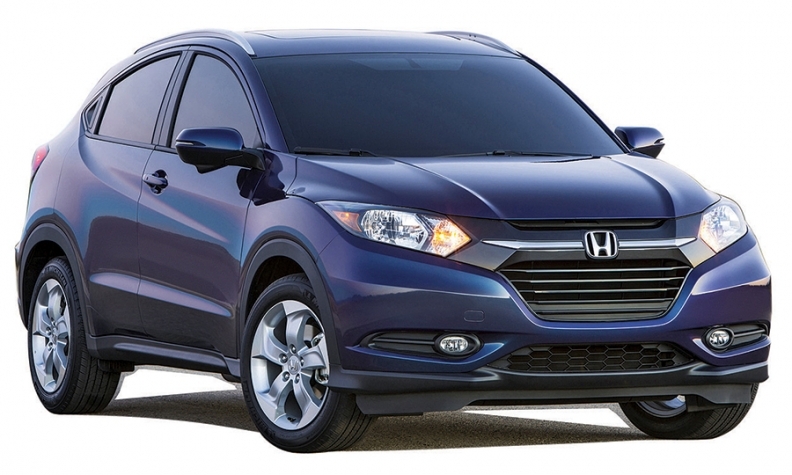 But the HR-V's delay won't hurt Honda, Sullivan said. Because it's all-new, most customers don't know to look for it yet. And it was better for the company to take a cautious approach, he said, than risk more errors of the type that tripped up the recall-plagued Fit. "Think of all the other distractions Honda has had with Takata" airbags, Sullivan said. "They can't afford to be doing things twice." The HR-V will start at $19,995, including shipping. Mazda's CX-3 will go on sale this year, and an unnamed Scion crossover is expected to debut in concept form this year. Buyers are flocking to the subcompact crossover segment because the vehicles are affordable, easy to enter and exit, and offer better visibility than sedans. Manufacturers love the segment, too, because it gives them a way to generate higher prices and wider profits from their small-car platforms. Even luxury automakers are piling in. Honda claims one crucial advantage for the HR-V: its clever interior packaging. Because it shares underpinnings with the Fit -- including the fuel tank under the front seats -- the HR-V offers more cargo room than competitors from Jeep, Fiat, Nissan, Chevy or Subaru. Subcompact crossovers accounted for about 112,500 U.S. sales in 2014 and are expected to more than double to 236,000, according to AutoPacific. By 2018, that number should be around 400,000 vehicles a year. That volume would put the category in the same ballpark as today's midsize SUV segment. This is one reason Honda is bullish about the HR-V's prospects. And cannibalization from the cheaper Fit hatchback and larger CR-V crossover isn't a concern for Honda. Some buyers will move out of those vehicles and into the HR-V, but the segment is so important that "well north" of 50 percent of HR-V buyers will be new to the Honda brand, Conrad predicted. AutoPacific is more conservative than Honda. It forecasts U.S. sales of 67,000 in 2016, the HR-V's first full year of production, then the mid-60,000 range annually after that.